A Santa Fe College Opening Doors mug will be given to the first 200 SF employees who complete FERPA and Cybersecurity training. April 3, 2019 – Santa Fe College is rolling out two new online employee training courses: FERPA (Family Educational Rights and Privacy Act) and Cybersecurity. These training courses are designed to give SF faculty and staff the information they need to protect student information, and provide a fundamental understanding of computer security and their roles in protecting electronic information. Both trainings will be mandatory for all SF employees by the beginning of the fall 2019 academic term, but SF employees may take the training courses as soon as possible. 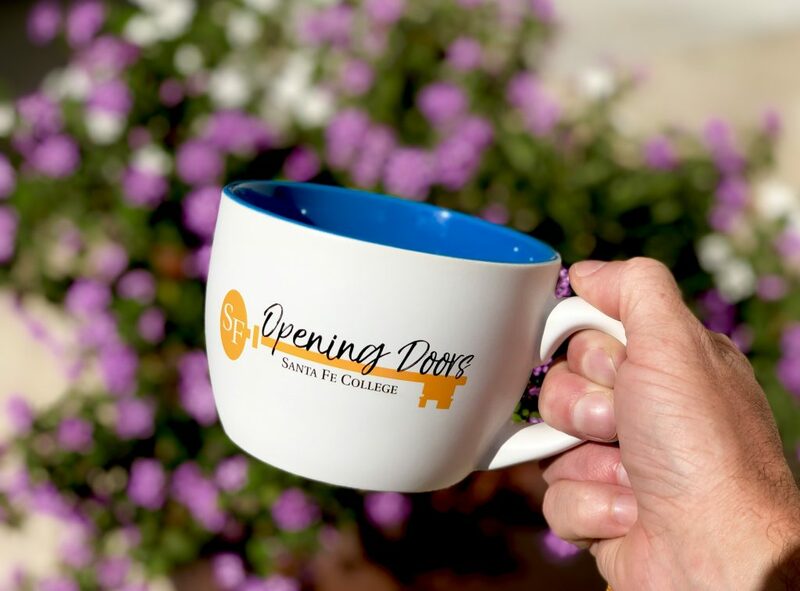 As an added incentive, the first 200 employees to complete both training courses will receive a Santa Fe College limited edition Opening Doors mug. The FERPA training is based on the federal law that protects the privacy of student education records and regulates what information can and cannot be released to the public. The cybersecurity training teaches employees about ransomware, safe web browsing, phishing scams, creating strong passwords and mobile device security. Both training modules are available by logging into Canvas and clicking on the “SF Employee FERPA Training” or the “SF Employee Security Awareness Training” link. For additional information about both trainings, visit sfcollege.edu/training. Supervisors are responsible for making sure all of the employees in their areas are aware of the training. If needed, accommodations will be made for employees who do not have regular access to a computer. Because this training is required by the college, it is intended to be completed during the employee’s work hours. All eligible staff will be added into the Canvas courses Thursday, April 4.